This entry was posted in malaysia Malaysia Immigration and tagged Malaysia visa Malaysia visit visa Malaysia visit visa requirements on June 20, 2016 by Blog Author. The heart of Asia, Malaysia is a beautiful country with people from all over the world, residing in it. It captures the essence of India. 1. Safety comes first. Malaysia is one of the safest countries to live in. It is buzzing with life 24 by 7. Despite a multi-faith community, Hindus, Muslims, and Christians co-exist peacefully. Surprising, isn’t it? 2. Malaysia is affordable. In fact, it is one of the most affordable countries in the world. Property prices are around $1,400 per sq. m. making it one of the cheapest countries to live in. 3. On the contrary, it is quite a luxurious country to live in. Well-equipped medical facilities, latest technology, and other modern amenities are some of them on this list. 4. Malaysia has one of the least complicated immigration processes. Malaysia My Second Home (MM2H) is a visa program that allows you to reside up to 10 years in this country as long as you can make a small investment which can go into purchasing a property. 5. It is so convenient for foreigners to own a property in Malaysia, without a lot of hiccups. 6. Flying out of Malaysia is strangely cheap. 7. One country that did not get rattled by the economic breakdown of 2008 and 2009, the Malaysian economy is strong as an ox! 8. While Kuala Lumpur is the concrete jungle, travel to islands nearby and witness nature at its finest. While the Great Barrier Reef is the most magnificent coral reef, Malaysian coral islands are second to none. 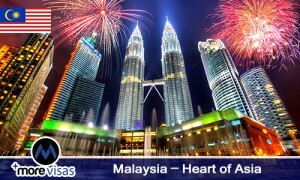 If you plan to migrate to Malaysia, there are different programs to choose from. You can pick the best option and be on your way. For more details, you can visit our website morevisas.com or come down to one of our centers.